At Children’s Garden Learning Center we plan activities that encourage cooperation, experimentation, and communication among children. We do not force children to operate as a large group for long periods of time. Instead we encourage children to let their curiosity and initiative drive them to make choices from a variety of classroom activities. Our teachers act as guides for these explorations, and investigators alongside the children. Our Emergent Curriculum speaks to the children’s individual interests and allows learning within a meaningful context. The children in our centers learn to negotiate, solve problems, and construct their own code of ethics; thereby learning true compassion and developing intrinsically motivated empathy. 1. Knowledge of the stages that all children go through and recognition of where each child is developmentally within these stages. 2. Identifying individual children’s strengths, interests and needs. 3. Knowledge of the social and cultural context of the children. This requires healthy, on-going relationships with the parents and family of the child. Let us get to know you! We want you to look around your child’s classroom, know what your child is doing, ask questions, talk with the teachers, exchange information, follow through with ideas from the center at home, stay involved. Share your culture, traditions and areas of expertise with the children and teachers! The preschoolers are building self-esteem while learning to control their body movement (large and fine muscle control) within their own space. They are also acquiring the ability to control their emotions within a group setting. We believe that by grouping the children by age at various times during the day, children are given the opportunity to explore activities that are specifically designed to interest their particular age group. Breaking into smaller groups also provides an opportunity for children to interact with teachers on a more personal basis. Teachers then have the opportunity to recognize each child’s strengths as well as the areas that need additional skill building. 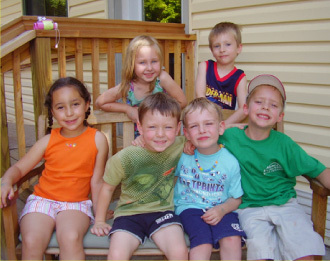 Our goal is to prepare children to make a smooth transition into Kindergarten at the end of their preschool experience. By preparing children socially and emotionally as well as cognitively, we believe that Children’s Garden graduates are given the foundation necessary to succeed in elementary education and throughout life.